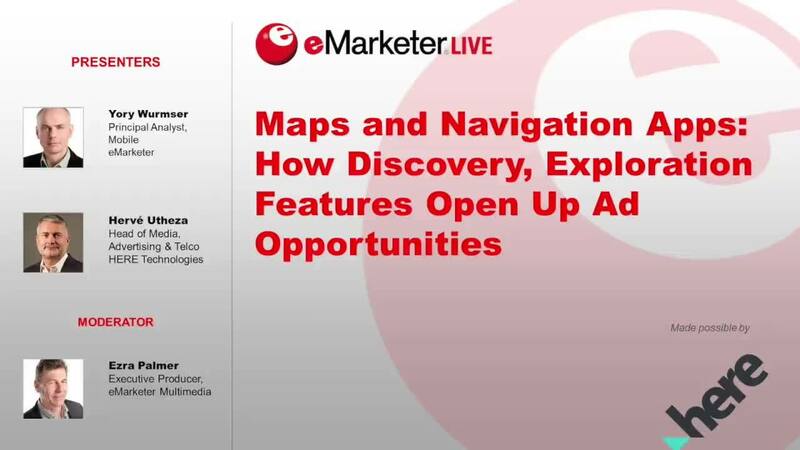 In a recent webinar from eMarketer, several thought leaders came together to discuss how location data is being applied to produce more relevant, effective advertising. To begin to understand how people consume maps, consider recent studies from eMarketer and Gallup which indicate that as many as 84% of adults with smartphones used a map application in April of 2018. Now, if you’re among that number, recall how you used that mapping application. Did you exclusively use the app before you made the trip? Did you use the map for real-time navigation as you made your way to a destination? Perhaps you used it for both? With those very different use cases in mind, marketers need to carefully consider how they’re going to utilize location data to reach and influence their desired audiences. A connected car, a connected city, and the new consumer journey. We have to look back at the history of TV, or consumer experiences. Each time a new technology breakthrough occurred, it spurred the emergence of new media formats, causing disruption in the advertising space, then adaptation, then innovation in media formats and ad units. As Hervé Utheza, HERE Head of Media Advertising & Telco explained, we can expect that connected cars will follow a similar evolution. In the U.S. people spend an average of 50-60 minutes in their cars daily. That 50-60 minutes is roughly equal to the amount of time the average person spends on social media each day. As cars become connected and grow in levels of autonomy, we can expect the increasing leisure time in vehicles will present similar opportunities that social media has provided. In time, the number of connected cars on the road will surpass the number of households with TVs. There is a big opportunity to take advantage of that amount of audience attention. Another clue to the evolution of media in vehicles is to understand why people are driving. On average, the smallest amount of time people spend in their vehicles is to get to and from work or school. The lion share of car time is when people travel to shop, run errands, or for social and recreational activities. Those are highly human, context laden, sometimes emotion rich experiences. Hervé also stressed the importance of patterns of data, as it is essential that marketers begin to think of location-based advertising in a geometric view of the world rather than a Point-Of-Interest (POI) view. This mirrored eMarketer’s Principal Analyst Yory Wurmser’s view that POI advertising is extremely niche, largely because history and pattern insight is essential. That same thoughtfulness will be in play in connected cars. Publishers, regulators, device manufacturers and tech companies alike are working to protect consumer privacy, which is welcomed by ultimately everyone, as it creates a stronger trust, a strong bond between the user and their favorite brands and services. In that search for the “compelling reason” to share a bit of data, it is worth noting that application users are most frequently willing to provide location data in the context of mapping, navigation and discovering the world. When handled properly, we can expect location sharing within a navigation context will provide a powerful insight for location marketing. Putting all these factors together is where advertising in connected vehicles has the most room to innovate. By combining screens inside the car, screens outside the car, voice interfaces, and location intelligence, a highly personalized, completely novel experience can emerge. As vehicles evolve, so too can the in-vehicle experience. We will move beyond the current app-store experience into something that combines industries and insights into a highly relevant, efficient mechanism for delivering content. Visit engage to see and hear more about the impact of location data in marketing.